Well, I've created a problem for myself! I've partially assembled the fuselage for the plane and added it's tail. 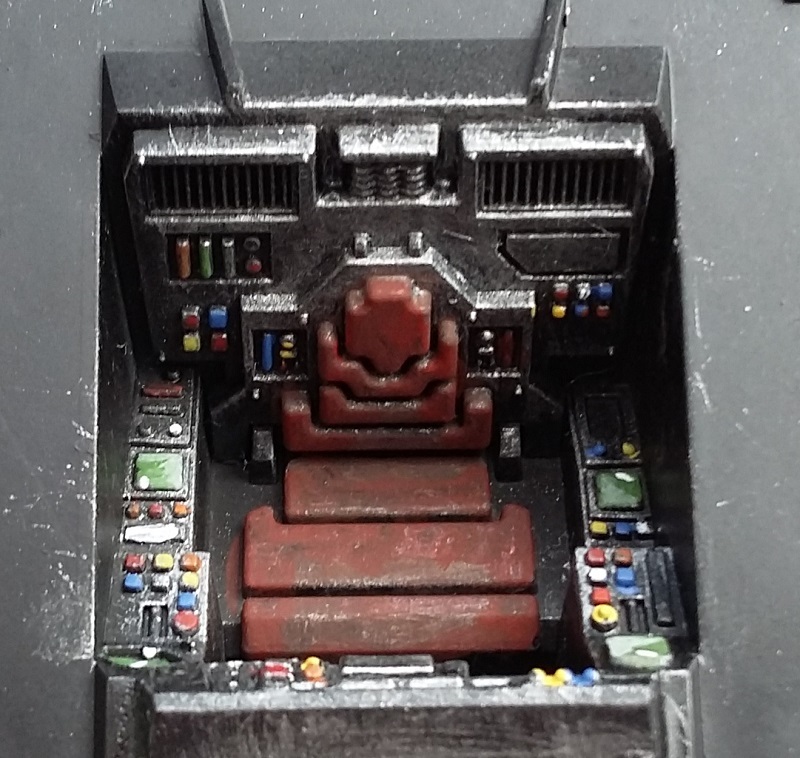 The issue is that the front and rear hatches (which both hinge in different ways) are both struggling to operate due to being pre-painted before assembly. 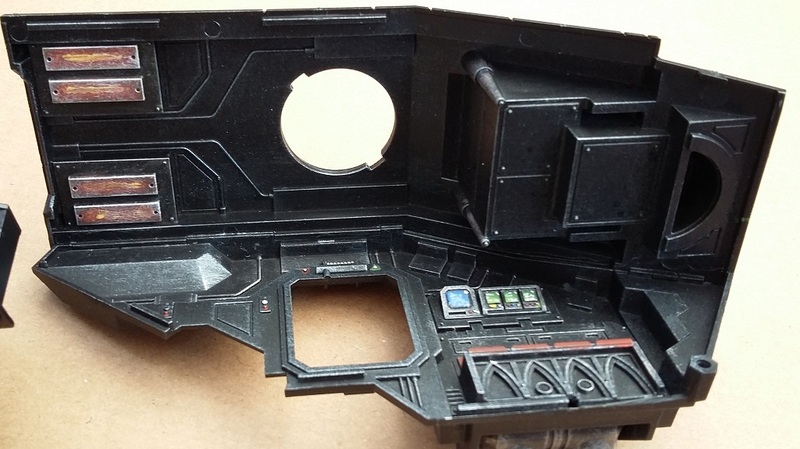 The front hatch has a "pin" either side that sits into a hole. 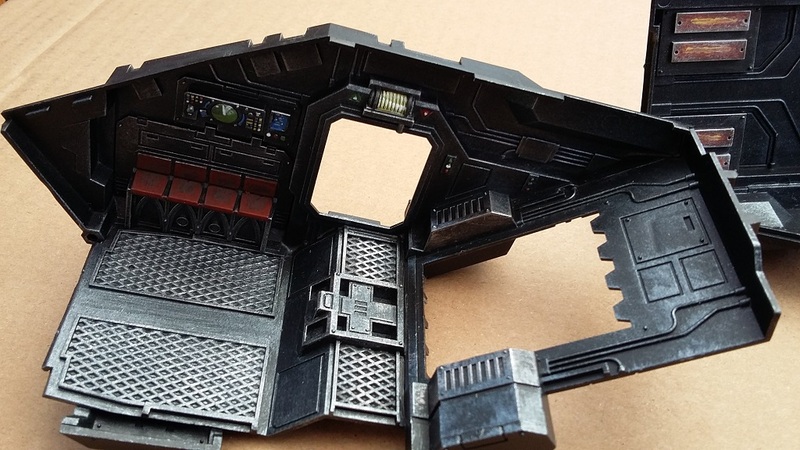 The paint makes it such a snug fit that operating the hatch is very stiff and won't fully close. I think when I'm finished painting and varnishing a spot of oil might actually sort this out. The rear hatch is different and more concerning. The hatch has a rod that runs along the hinge-edge which clips into a set of u-shaped receptors. 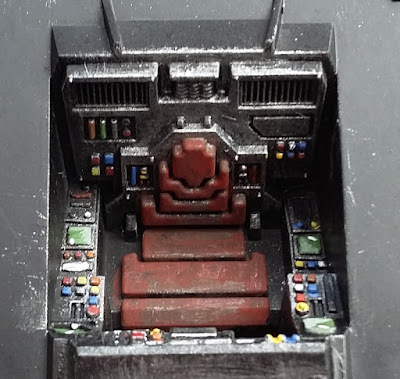 The paint on the hatch means that although you can clip it in it pops back out again when you try to operate it. I'm worried that the u-shaped receptors may eventually spread open to a point where the hatch won't stay on at all and will need to be glued into place. That would be a pain simply because I'm planning to attach the hurricane-bolters rather than the side doors and that would limit the amount of light getting into the inside of the model making all the detail I painted on the inside invisible. Ah well - I'm sure something will occur to me. 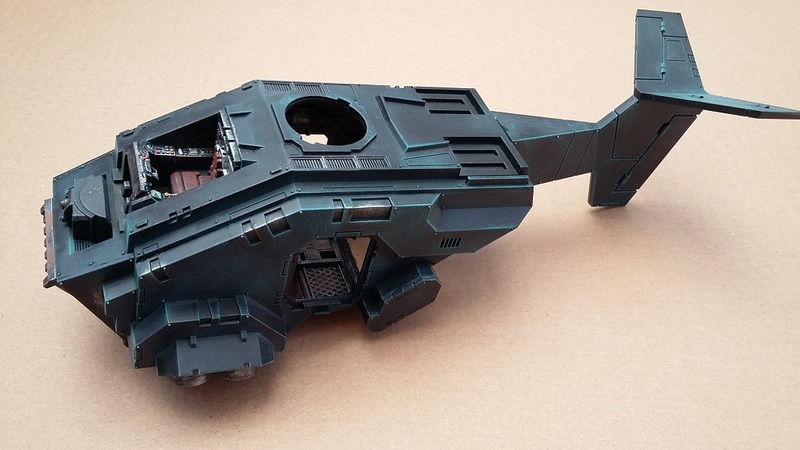 I've made a start on the drybrushing of the fuselage - I'm drybrushing turquoise over black and it gives a pleasing effect I think. It worked nicely on the rest of my Marines. I'll do another layer of turquoise near the apexes of the places where panels join up, and then a small spot of white on the very tips of the corners. Time to start another small project. I never got around to applying decals (mostly due to indecision - I wanted the Raven Guard decal to form the basis of my "Stormcrow" chapter badge but was going to apply a lightning detail to it but have never managed to decide exactly how to apply that detail). Since I built them I have settled on a basing scheme that I like so they all need their bases updating. I've been nudged out of inaction on the Marines because I've obtained a Stormraven Gunship model as a birthday gift. So my intention is to paint up the Stormraven and then inch my way through updating the rest of the army with basing and decals before working on the outstanding units. I introduce to you the latest member of my pirate crew, ready (apart from being slightly under-dressed) to head into the ruins of Frostgrave for some treasure hunting. 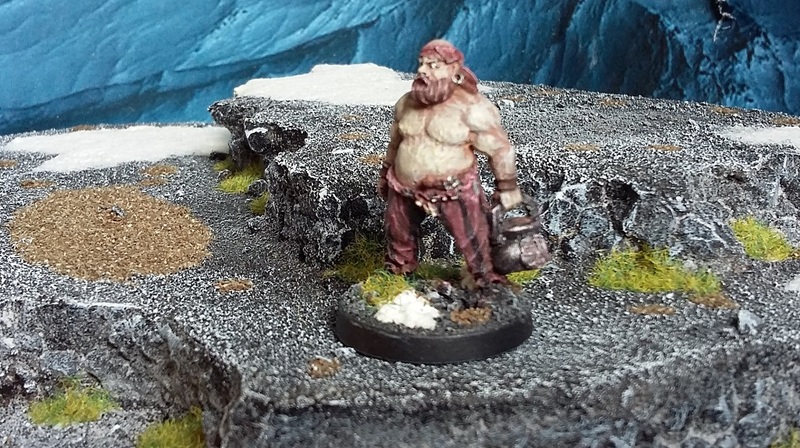 In actuality, he's supposed to represent a ship's cook, but I'm taking the burly build to represent "Thug" and the soup-pot to be a small treasure find that he's already made. If you can't imagine things in a Fantasy game, where can you? Here we arrr! 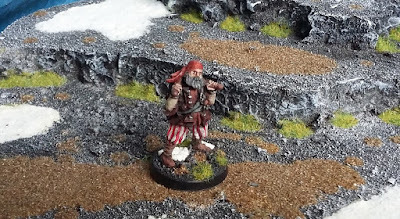 (sorry) with another pirate for my warband. 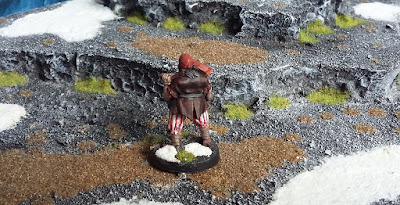 This chap due to holding two pistols is going to count as Crossbowman. I want Pirates, but you try finding one with a crossbow (or a bow or shield, for that matter). Just three more models to go. 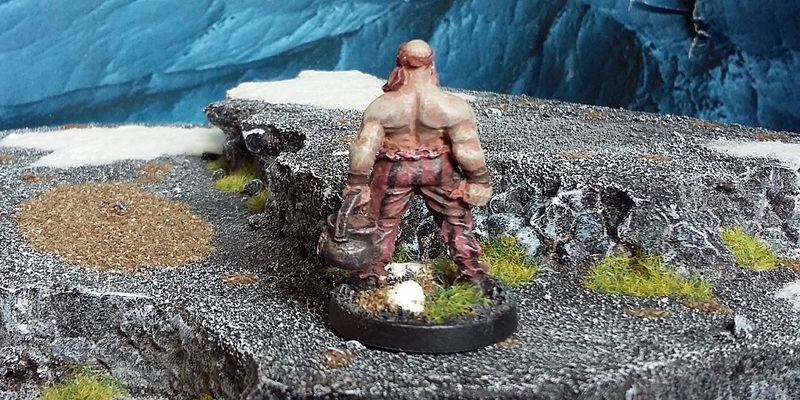 Another of Black Scorpion's excellent Pirates range - this chap is actually a Ship's Navigator model. Well, after two weeks of doing NOTHING (due to nothing other than sheer laziness) I decided it was time to pull my finger out and get some work done. I've got other projects waiting in the wings and I promised myself that I'd get these guys finished by the end of March. 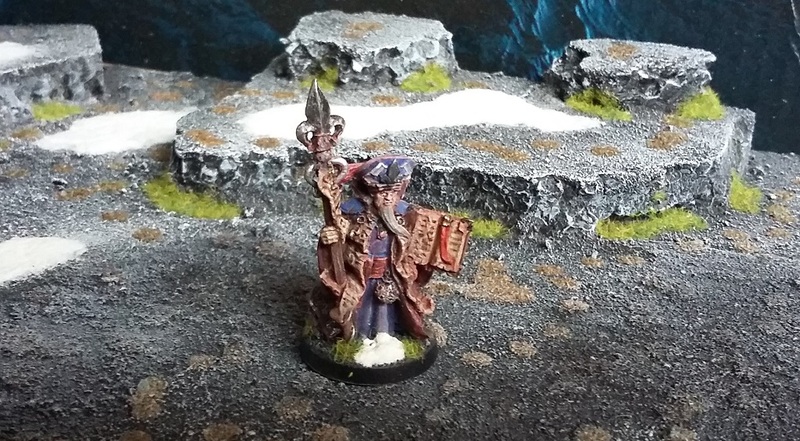 Here is my Frostgrave Pirate wizard: part of Black Scorpion's Pirates range. They do a few models that you may find on board a ship who aren't necessarily pirates - a Cabin boy and Navigator (more about them later) and this chap: a Cleric. Makes a good Wizard, I think.